Jim, The hated Boston Red Sox? Come on now, why aren’t you helping the Minnesota Twins, our pitchers could use your advice for sure. Francisco Liriano really needs a whole lot of help from a lefty like yourself. Take care of yourself Jim! The Twins invited me to come in as a volunteer coach for a few days as they did last year…….the RedSox were the first organization in over 25 years…since Pete Rose asked me to be his pitching coach…. that actually got serious about having me share my ideas on pitching. Ben Cherington and Allard Baird and Bob McClure took the time to come to my home in Florida and interview me about my ideas and ask what I might be able ‘d like to do to help..I was flattered by that..I enjoy giving back to the game in the field of pitching which is my only real area of expertise based on my own experiences…..I feel honored to try to justify their interest…. The Red Sox? As a Yankees fan, I’m saddened because I know your insight and advice is going to help and improve their staff. If I was a pitcher today, I’d ask you to lunch every week to pick your brain. These pitchers are foolish not to talk pitching with you. I’m happy that you’re back in the game, even if it is Boston. I enjoy your stories and wisdom! I agree with your logic on pitching “Throw the clicker away” etc. We miss you on the Yankees broadcasts. Just curious, because I respect your opinion – Who do you think invented the game? I was always told Doubleday, but there seems to be some conspiracy theories. Since I don’t know for sure, I’ll subscribe to whoever YOU think invented the game. If it’s good enough for you, it’s good enough for me! Kitty: I’m another Yankee fan who wishes it wasn’t the BoSox receiving your wisdom this spring, but to their credit, it is. If it wasn’t for the Red Sox, our Yankees wouldn’t be as acclaimed as they have been through the years. To be great you need great opponents. What’s the greatest rivalry you have been a part of? Mr. Kaat, Great post as usual. If you had to put together the best possible lineup that included only former teammates of your’s, who would be at each position and which of your former managers would you consider to be the most skilled at their craft. I posted here yesterday but guess my post is subject to approval. I think is because I included my MLB Blog at the bottom. I had the same thing happen to me before. I told Mark, our fearless leader here. He is the one that tells us to include our MLB Blog link. Anyway, what I said was that I love the Whitey Herzog quote. Speaking of Koufax, I miss going to Vero Beach because it was so much fan friendly and the posibility of running into Sandy Koufax there. Still, I’ve been going to Camelback Ranch, where the Dodgers priactice since they moved here. Congratulations on your new role with the Red Sox. I love your reports! Keep up the great job! Hi Jim, Great to see you are helping Mac out. I used to play pick up basketball with Bob at the YMCA in Brookfield, WI and he was a partner with my baseball simulation game Pursue the Pennant which has been heralded for it’s realism. I live in West Palm Beach, FL and am hoping to get over to Ft. Myers to see Bob and would welcome meeting you. An old American League fan here, one who remembers you from your days with the Twins, White Sox, Yankees, etc. I’m a Red Sox guy who lives in Connecticut, so through the years I have always had access to Yankee telecasts as well…used to love to tune in to root against the Bombers while listening to (and learning from) Kitty Kaat. Really miss your input on those broadcasts…they are definitely not the same without you. But it’s great to hear that you’re still active around MLB…and helping out my Sox! Take care, my friend. As always, I love your insights and passion for baseball. Best of luck in your efforts to pass on words of pitching wisdom to another generation of players. I look forward to your next post. All the best. I can’t believe that there is only 42 of us! It is a privilege to talk to you! Gene Woodling was my favorite player as a kid- what do you remember about him? Signed, a former righthander. Hi Jim, could I get your email. I would like to ask you some things about pitching and comment about our great late boss. Mr. Kaat, I just discovered your blog and I’m enjoying your posts. Question: What do you make of today’s news about Joakim Soria? I don’t recall a pitcher “feeling sore” in spring training and just like that needing season-ending surgery, although I suspect it has happened before. I’m so glad I happened to stumble upon this blogger page. I’m 59 and still an avid baseball fan, after a career as a sportscaster and broadcasting instructor. You were my favorite player growing up in Minnesota, and still feel you belong in the Hall of Fame. What always impressed me was your attention to detail, something that seems to be missing with a lot of athletes these days. My son once asked me why you were my favorite player. Why not Harmon Killebrew, for example? 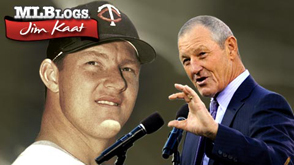 While I loved the Killer too, I told Pat that Jim Kaat wasn’t just a great pitcher. A great fielder, as 17 Gold Gloves would attest. A great hitter, back in the day when DHs weren’t around. Always kept himself in tremendous condition. And later, not surprisingly, I would come to admire your work as a commentator as well. Your reference to Warren Spahn in this article, brought back fond memories of a quote you had on my 1965 Twins’ highlight record. I remember when you pitched the clinching win against the Senators that year, you said you had recalled the Spahn advice in the midst of that crucial game. It helped you to avoid throwing any “lollypop pitches” to the Washington hitters. Thanks for all the great memories and I, too, look forward to following your posts regularly now! Jim, you are a real treasure to the game of baseball. I really enjoyed your broadcasting and am old enough to remember your playing days. Greatest fielding pitcher in history. My personal love of the game is something I share with you and I always appreciated the way you characterized when it was time for you to retire: “When they drag me off the field.” Your approach to pitching was and continues to be (as a mentor) the product of an astute mind always willing to learn and grow. Location and movement! Command the fastball to all four quadrants. Yes! Jim, I miss you doing Yankee games! This is the second time I have read you getting pregame advice from Whitey Ford. I wish I could have been there listening so I can pass on that grip to my lefty son! Would you mind explaining that grip? He needs more movement!